Desert Wishbone Bush is a member of the Four O'Clock Family. The plant grows to 2 feet in height and has dark green, hairy, oval to kidney shaped leaves that grow to 1.25 inches in length. 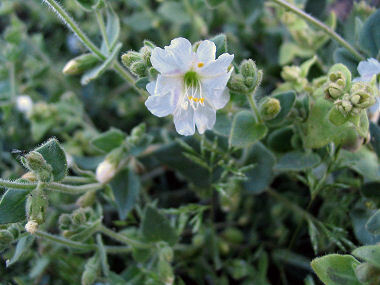 The plant typically grows in desert flats, slopes and canyons at elevations below 3000 feet. Desert Wishbone Bush is named for it's branches which have the characteristic wishbone shape. Desert Wishbone Bush blooms between March - October and produces white to pale pink, funnel-shaped flowers to 0.75 inches in width.